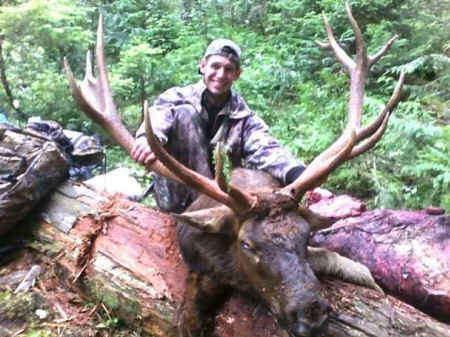 A Cowlitz County man has been placed on probation, fined $2,500 and stripped of his hunting licenses for three years for shooting a Roosevelt elk inside Olympic National Park in 2007. Robert Hurst, of Woodland, also was ordered to perform 80 hours of community service and turn over to the government all parts of the elk, which he had killed with a bow and arrow on Sept. 19, 2007, while hunting in the Litchy Creek drainage on the park's remote southern boundary, according to a news release from the U.S. Attorney's Office. Robert Hurst, of Woodland, Cowlitz County, poses with a trophy Roosevelt elk he shot in 2007 in Olympic National Park. Hurst was sentenced Monday, Jan. 25, 2010, to three years probation and had his hunting licenses taken from him for three years. Hurst lured the elk within range and then killed it, field dressed it and carried it out over several days. Hurst was stopped by state Fish and Wildlife Department officers on Sept. 23, 2007, while transporting the head and cape of the animal. A DNA test later linked Hurst's elk to the kill site within the park, according to federal prosecutors. The park contains the largest unmanaged population of Roosevelt elk in the country. The Roosevelt elk are larger — a bull elk can reach 1,000 pounds — and darker in color than their more-common cousin, the Rocky Mountain elk found east of the Olympic range, according to the park's Web site. The species was once found on the west side of the Cascade and Coast ranges from the San Francisco Bay Area north to Vancouver Island, according to the park. Today, Roosevelt elk are limited mostly to managed herds. In handing down the sentence Monday in Tacoma, U.S. Magistrate Judge Richard Creatura said, "This animal was a prize possession of each and every citizen who enjoys the park, and that possession has been taken away."